Create a formula for the week’s meal plan to make meal planning simple and easy. You’ll have a template to fill in each week for a quick menu plan. 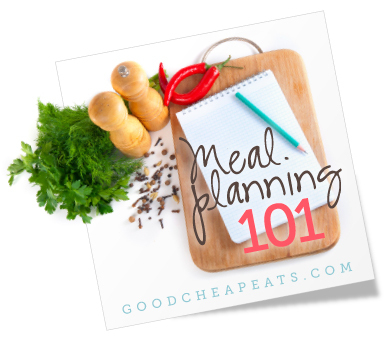 Meal planning is a proven means to help you improve your nutrition, increase quality family time, and save money. If you’ve got a meal on the table in a timely manner you eat well, have something to enjoy with friends and family, and avoid costly restaurant meals or excessive trips to the store. Meal planning makes for good eats. This past weekend I spent some time reorganizing the refrigerator, freezer, and pantry. An inventory helps me know what we have, what we need, and how to spend my kitchen time in the coming weeks. Since the months are changing right now, I have fresh in my mind the status of our grocery budget and an inkling of the changes I want to make in our spending in the coming month. Meal planning plays a huge part in all that. Some folks don’t meal plan. I haven’t figured out what they do do, but readers have said that they don’t. Others are pros. And the rest of us fall in the middle. I’ve been planning my meals on a weekly or monthly basis for the last 18 years. And some nights I still go to the fridge and say “What are we going to have for dinner?” Some days I give in to the last-minute call to take-out instead of being more intentional about our dining experiences. 1. The meal plan is there to serve YOU. If a certain meal turns out not to work on a given day, ditch it and go to Plan B. 2. If you don’t like committing to Meal A on Monday, Meal B on Tuesday, then don’t. Just create a list of 7-8 meals, make sure you have the groceries, and slap the list on the fridge. Cross off meals as you serve them. 3. Leftovers can make a meal. These items should be cooled and frozen right away or refrigerated and consumed within three days. 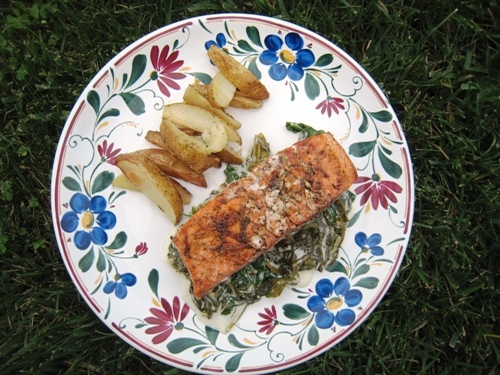 Leftovers make easy lunches or the basis of a new meal altogether. Or just reheat and eat. Create a dinner plan formula for the week. One of my favorite strategies for meal planning is to use a formula of theme nights to determine what we eat on a weekly basis. This means that I choose a variety of meal types, decide in advance how often we’ll have a certain type of dish, and just plug them into the different days of the week. A meal plan for the week comes together quite quickly because I’m not putting a lot of thought into the whys and wherefores. I already have a formula. And it’s so easy! I like to mix up the flavor profiles of the foods we eat. We tend toward certain favorites, like Mexican and Italian, but I like to mix them up for variety. Here’s how different ethnic foods can be dished up throughout the week. Meal planning by protein type allows me to keep the price of our groceries in check. If we go meatless several times per week, we’ll keep our costs low. Maybe your weekly meals are determined by the time you have to cook. I get that. We’ve got hockey two nights a week, date night one night, and one night where I’m away from the house. This makes for four nights when I don’t want to or can’t be in the kitchen. And that schedule determines what we eat. There have been other times when my formula or theme changed with the seasons of the year. Hot weather calls for sandwiches and salads, while colder temps and winter grocery sales call for more stick-to-yer ribs fare. Here are a couple examples. This month I want to be more organized in my shopping, cooking, and supper serving. So I created a new formula for October, that I’m calling the Eclectic Plan. 😉 I took into consideration all the different styles of themes, stirred in a good portion of freezer cooking, and am hopeful that this will help us eat well and stay on budget. I planned a hypothetical eighth meal for back up. Because, really? Who are we kidding? In addition to making a creative and varied “formula” for each week, I also put together a freezer cooking plan that will take me through the month, better able to stick to these themes as the month progresses. More on that later this week! Do YOU have a formula for meal planning that works for you? We do have a meal plan. Mine is different though. I plan with the different types of meats that we eat; Beef, Chicken, Pork, Ground Beef and so on. We also plan a vegetable night, where we have just vegetables. Some kind of beans as the protein and then other vegetables to fill in. Some meals we only eat in summer and some meals are winter meals. But it all works out. I am loving this series! Thank you so much for putting it together for us. @Deborah Jennings, I’m so glad to hear it. It’s hard to know if it’s helpful unless folks comment. We’ve actually planned, not around the meats, but around the starches. I read it in Simplicity Parenting and it totally clicked with me. I know usually what meats we’ll have on hand, but I can’t always guarantee based on prices. If I plan around the starches, (rice, potatoes, pasta, tortillas, etc) I plan around the less expensive part of the meal and make that more of the priority. It works. I’ve never heard of that method, but it sounds like a good one. We actually talked about that last night, hubs and I, when we differed on taco filling. We knew we wanted tacos with homemade tortillas, so it was just a question of settling on the filling. I’m at that life stage where I am Mom’s Taxi – I’ve learned that any sort of formula is destined to fail and then I don’t follow the plan at all – for me, I know what I”ve got in the freezer or I take a quick peruse – then I base the choices mostly on the calendar. Some days there’s time to prep – some days it has to be instantly ready – so I plan that way. Also this week was a true testament to the freezer – virus hit me WICKED hard – the meals planned got axed and ‘instant’ freezer meals subbed in – thank heavens! @cherie, I have a few taxi days myself. That’s why I’m mixing things up a bit. I think we follow a mix of seasonal and length of time for prep. Some days we are out late for dance class, so it’s a slow cooker night. Next night we are around so I’ll take a little more time for prepping a meal throughout the day. I make my meal plan every Sunday and post it on my blog. It has helped keep me accountable for finishing this task each week. On my goal list is to try to make some freezer meals now that we picked up a chest freezer. @Emily @Random Recycling, yeah on the new freezer! How fun! 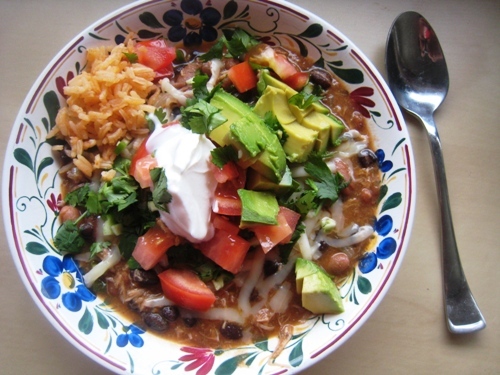 Last winter/spring, our weekly formula included one slow-cooker meal, one breakfast night, and Taco Tuesdays. I think we got tired of that because now there isn’t much of a formula with one slow-cooker meal per week plus a bunch of other random meals. But something isn’t working right now because my boys are NOT eating what I’m making and I don’t want to eat what I think they will eat! Grr, preschooler eating habits! Thanks for all the ideas, Jessica! Great article! It’s fun to see all the different types of meal plans that can be used and you have given me some good ideas to try at home. I stockpile which means that I buy a lot of something that is on sale. Then I store it in the freezer until we need/want it. I still work with the sales, but don’t use it up in the week that I buy it. That way we get more variety and still save money. When I first started meal planning, I had a theme for every night. That, however, felt a little too constricting. It always felt like there were meals we liked that didn’t fit into my themes. Now, I have a mix. Mondays and Thursdays are vegetarian, Wednesdays are leftovers and Fridays are pizza. Tuesday, Saturday and Sunday are filled with whatever strikes my fancy. love, love, love the way you categorize your thoughts. you are teaching me how to think better. it’s all ideas i’ve heard before, but the way you connect your words makes the concept very approachable. thanks. off to read more links. Awww, thanks for the kind feedback. Good to know I’m making sense! Just wanted to leave a comment to say thanks for the thorough meal planning step-by-step guidance! I’ve been looking for help figuring out how to start meal planning for a while, and all I’ve come across on the internet are either packages you have to buy or a big list of recipes. I know how to look up recipes online! What I really need is help thinking through the whole process, which your website does! My husband and I have been married a few years, both work, and have always struggled to have consistency with making real meals for dinner and having good food around for breakfast and lunch. We are frugal to the max, so one of the barriers for us is always not buying enough things at the grocery store because they are too expensive, too nice, etc. We are at the point now though where we are realizing we probably won’t ever look back and regret buying good, real food. It has been a shift for us to feel ok spending the money on organic milk, nice fruit, quality cheese, etc. But now that we are ready to spend a little more on our grocery shopping, we are at a loss for how to plan and prep meals consistently during the week. Hoping your website will continue to help us change that! Thanks very much for the clear, honest, helpful thoughts on meal planning!! I hope so, too! Thanks for the great feedback. I know you might not need the recipes, but you can see how I built the plan to use up leftovers and waste very little. They are also very make-ahead which should help during busy work weeks. Thanks! I’m still working through the whole series you have posted and will definitely check out the free plans. We have a huge garden so another priority for us is using the produce as best we can. This often feels tough to do when we are sort of in a routine and then suddenly there are pounds and pounds of tomatoes, cucumbers, zucchini, and more to integrate into our meals. We do preserve a lot of our produce, so we don’t have to use it all fresh. But it still requires a shift in planning during the summer/fall that wouldn’t be there during the winter/spring. Looking forward to getting on track with this! Thanks again! It’s a good problem to have, all that food. Hang in there. I use this formula to make 30+ freezer meals ….protein+grain+veggies+sauce+cheese/topping/crust ….this works with any seasoning/theme 🙂 For example Ck and rice with broc , or zucchini lasagna, or southwestern ckicken pasta, or shepards pie, or ck pot pie 🙂 I make my own cream of chicken or mushroom soup (3-4 quarts) then add seasonings to it to make sauces, or I make a tomato based sauce. Its an oil/flour roux + milk/cream + ck broth onions and thyme salt/pepper. Ugh, I love you! I discovered you on Periscope (that was you, right? Everyone I follow always wants me to watch you. Heehee.) But I found THIS site cause I googled “meal system for every day of the week” or something like that. I just needed fresh inspiration for themes and it was SO smart of you to make this post! YAY! I’m on Periscope, so I hope that was me! 🙂 jessicagfisher over there. Glad you found me, either way! Let me know how I can help! Yay! I spend a lot of time on there… haha. I need help SEO-ing my posts right now! LOL! Feels so sell-out-y! I mean, all things home related are also helpful. =D But I need help with my site. And long tail keywords. Makes me want to cringe. If you have any advice on that… I know not all home-mom-bloggers want to talk about that, but it’s like a foreign language to me. Gahhh! Oooh, do you go to bloggers conferences? Which ones do you recommend? I’ve been planning meals monthly for about 35 years now . At the end of a month I take inventory of freezers , cupboards and pantry … then start making menus . I use grocery store flyers and always buy my meat on sale . Over the years menus have changed , as our tastes changed , and children left home . Now that my husband is retired he helps with meal preparation , it’s taken some getting use to , but we are getting better at working together . 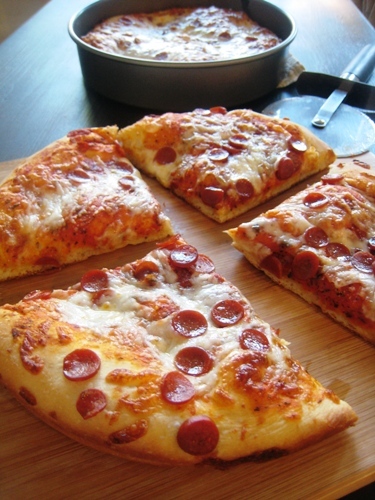 We love pizza and quesadillas , so we have them twice a month , usually on Monday nights . 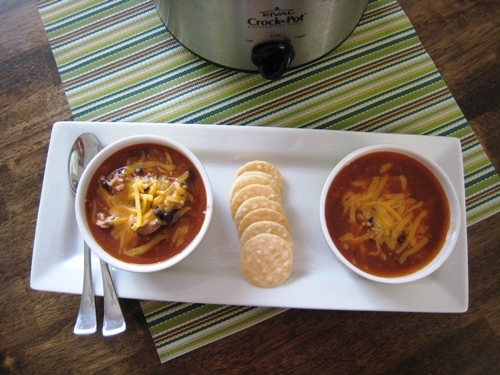 Tuesday nights are usually pasta nights , Wednesday I try to make a nice meal , Thursday is easy night … hamburgers , Cuban sandwiches or wraps … Friday night is usually a big pot of soup and then we eat it for lunch on the weekend . Saturday night is pretty flexible … easy meal that are just thrown together ( usually from the pantry ) tuna casserole , or salmon loaf . Sundays are meat and potatoes night . We have a garden , it’s pretty big . I can tomatoes , salsa and pickles . We have potatoes , carrots and onions in a cold storage room in the basement . I freeze peas , beans , beets , cauliflower , broccoli , and carrots . It’s a lot of work but it makes meals so easy , because we always have lots on hand . Breakfasts are cereal and fruit on Mondays ; Tuesdays are muffins and fruit ; Wednesday is poached eggs on toast ; Thursday is bagels and fruit , Fridays are French toast , fried eggs on Saturday and my husband makes apple spice or blueberry pancakes . He often makes a double batch and we freeze them for those mornings when you want something really quick . When I started planning meals years ago everyone said it wouldn’t last … they were wrong . If I don’t feel like cooking a certain meal , and some nights that is the case , I always have lots of food and just change menus around . I think we save money and it solves that age old question ” What’s for Dinner ” ? We just have to look on the calendar on the fridge to see what’s on the menu . Sounds like you have a fabulous system, Ann! Well done. How do you get your items to freeze well? We have tried freezing pancakes but they turn out freezer burnt pretty quick.I would love to hear more about your meal planning and preparation. I love your meal ideas. My trick for pancakes: bake them on the griddle and then cool on a rack like you do cookies. Once they are cooled, wrap short stacks in plastic wrap and then place in a ziptop bag. We don’t get freezer burn at all. Just pull out as many as you want and reheat. Thank you Jessica! We will try this method for sure. I have just discovered your page and love it. It’s got me in the mood to meal prep as well. Yay! We put waxed paper in between ours in the bags, then the kids just pull them out and throw them in the toaster. Super simple!! LOVE this series!!!! So helpful to my clients!